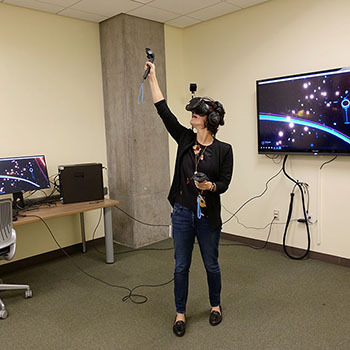 An opening celebration to formally launch the VizWall, a large-scale visualization installation, and the VizLab, a Virtual Reality and 360 Lab, will take place on February 7, at the David Kirk Digital Scholarship Commons on the ground floor of McHenry Library. The VizWall is a 14'x4' screen installation that enables large scale presentation of visual materials or simultaneous interaction with multiple pieces of digital content. It now offers the entire campus community a new space to visualize their research and create interactive digital media. The new VizLab creates an opportunity for students to experience and develop projects in Virtual Reality. It also provides the campus with access to a high performance, graphics intensive workstation with available 3D modeling, animation, and Virtual Reality software. These new spaces were created through partnerships between the University Library, The Humanities Institute, the Humanities Division, CITIRIS, and the IDEA Hub. Deblinger added that the lab space has already been used for curriculum. 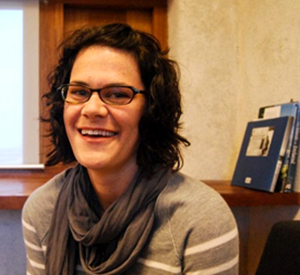 The opening reception will include a presentation by assistant professor of history Elaine Sullivan about her work with 4D models of ancient Egyptian temple sites. Demonstrations in Virtual Reality will also be available throughout the event. The Digital Scholarship Commons plans to additionally host two lectures at the VizWall this winter. 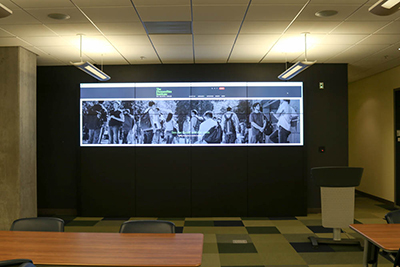 The University Library’s reception to celebrate the opening of the VizWall and VizLab takes place on Wednesday, February 7, from 4 p.m. to 6 p.m., at the The David Kirk Digital Scholarship Commons, located on the ground floor of McHenry Library. Admission is free.